William Astle was born in 1890, the son of William Charles and Louisa Astle (nee Tonks). By the time of his death, the family were living at 9, Worcester Place, Penn Road, Wolverhampton. According to a small item in the Express & Star on 15 September 1916, Astle had in fact worked for the newspaper concerned prior to the outbreak of war. He was later employed as a manual instructor under the Wolverhampton Education Committee. A report also appeared in the Midland Counties Express on 6 January 1917. This has the additional information that he attended St John’s School for eight years without a single late or absent mark recorded against him. He had worked for the Midland Counties Express as well as for the Express & Star for two years. He then decided to become a teacher and was articled to the Wolverhampton Education Committee, getting a job as assistant master at Walsall Street Council School. A well-known footballer, he was at one time captain of the Old Church Club in Wolverhampton. 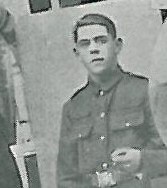 He enlisted with the 1st/6th Battalion of the South Staffordshire Regiment, and became a Lance Sergeant (number 2824). A report in the Wolverhampton Chronicle dated 20 October 1915 listed him as one of the local men reported as wounded. However, it was later confirmed that he was killed in the attack on the Hohenzollern Redoubt on 13 October 1915. He is commemorated on the Loos Memorial in France. James O’Hara Pearman was born in Shiffnal in 1882. According to the article that appeared in the Wolverhampton Chronicle on 7 February 1917, he was educated at a school in Jamaica where his father was a headmaster, before studuing at Caius College, Cambridge. He was the son of the Reverend W. L. Pearman and Mrs Pearman of 2 Richmond Road, Wolverhampton. Before the war he had been doing “educational work” in Huddersfield and was hoping to be called to the Bar. When war broke out, he enlisted as a Private in the Royal Fusiliers, later becoming a Second Lieutenant in the 13th Battalion of the Royal Warwickshire Regiment. He was killed in action on 25 January 1917 on the Tigris, and is commemorated at the Amara War Cemetery in Iraq, as well as on the memorial in St Jude’s Church, Tettenhall. 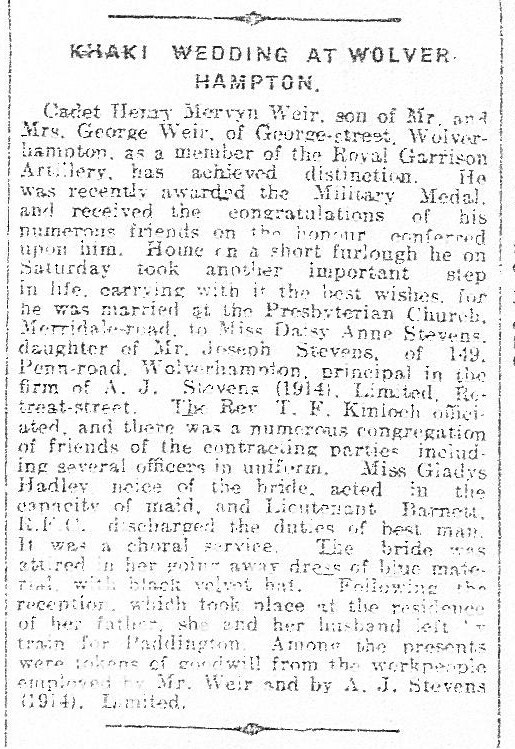 There is a happier article in the Wolverhampton Chronicle of 7 February 1917, celebrating the wedding of Cadet Henry Mervyn Weir and Daisy Anne Stevens at the Presbyterian Church in Merridale Road. Henry Weir was born in Wolverhampton in 1892, the son of Mr and Mrs George Weir, of George Street. He enlisted with the Royal Garrison Artillery, and had received the Military Medal by the time he got married in 1917. His bride, born in 1890, was the daughter of Joseph Stevens of 149 Penn Road, principal in the firm of A. J. Stevens Limited. In the 1901 census, the Stevens family were living at 11 Tempest Street, and consisted of Daisy, her parents Joseph and Sarah, four brothers (Albert, George, Joseph and William), and two sisters (Ethel and Lilly). The article noted further details of the ceremony. It was conducted by Rev T. F. Kinloch, with a Miss Gladys Hadley (the bride’s niece) being maid of honour and Lieutenant Barnett being best man. The reception was held at the Stevens residence, before the couple left by train for Paddington. Weir appears to have survived the war, and the couple went on to have a son, Allan, in 1920. A notice appeared under the “Local & District News” in the Express & Star 22 Aug 1916 stating that the father of Private Clarence Arnold had received notice of his death in a clearing station in France, following wounds received in action. Clarence Arnold was born in Wolverhampton in 1895, the son of Daniel and Isabella Arnold (nee Lowe). In the 1901 census, the family are at 144 Willenhall Road, Heath Town, and consists of Clarence, his parents, brothers Daniel and John, and sisters Daisy, Edith and Elsie. On leaving school, Clarence worked for the Rees Roturbo Works, and the family moved to 12 Hincks Street, Ettingshall Road. In the first weeks of war breaking out, Clarence enlisted with the 15th Hussars (number 15342). He died on the 1 August 1916, and is commemorated at the Heilly Station Cemetery, Mericourt-L’abbe, in France. The son of Henry and Cecilia Gardner, Dudley, known mainly as Graham, was born in Wolverhampton in 1893. In 1906, his mother remarried a Harry Dews, so Graham and his brother Laurence were living with their mother and step-father at 212 Newhampton Road East, Wolverhampton, in 1911. Graham was working as a locksmith. According to the article that appeared in the Wolverhampton Chronicle on 20 October 1915, Graham was a prominent sportsman in Wolverhampton. Whilst at the Higher Grade School he competed in school swimming championships in 1907 and 1908, along with Wolverhampton championships. He also played for a number of seasons with Old Church Football Club. He enlisted in the 3rd Battalion of the South Staffordshire Regiment in August 1914. During his training he was promoted to sergeant, but in order to get to the Front sooner he relinquished a stripe to join the 2nd Battalion. He was drafted to France on 4 May 1915. His actions on the field soon earned him promotion to sergeant again. He was killed in action on 25 September 1915, ordering his men to “Follow the officers.” Two photographs of him with his football team (including one photograph taken at the rear of our building, the Molineux Hotel), feature in Roy Hawthorne & Jim Dowdall’s book, Images of Wolverhampton, although no further details about him are included. He is commemorated on the Loos Memorial in France. Enlisted in February 1916, served in the R. A. S. C. in France and Belgium, obtained General Service and Victory Medals and was demobilised in June 1919. Charles Edward Armstrong was born in 1897, the son of Joseph H. and Phoebe E. Armstrong (nee Davies). On the 1901 census, Armstrong is living with his parents and sister Edith M. at Neal Place, 20a Chapel Street. His father is an Insurance Agent. BY 1911, they have moved to 24 Hordern Road. Charles’s father and sister are now listed as Harry and Marjorie respectively, presumably their middle names as that would fit with the initials on the 1901 census. His father is now a School Attendance Officer, and Charles has become an Engineer’s Office Boy at a motor cycle company. Charles’s military records have not survived, apart from his medal card which states that he was in the R. A. M.C., number 2478. Charles married Ellen Meacham after the war in 1927, but they do not appear to have had any children. Following the sinking of three Royal Navy ships (HMS Aboukir, HMS Cressy and HMS Hogue) by a German submarine on 22 September 1914, the Express & Star featured the story of Reverend Wilfred Ellis, formerly curate of St Andrew’s Church in Wolverhampton, who had been chaplain on the HMS Hogue. He had volunteered for service on the outbreak of war, and had joined the HMS Hogue (which comprised 600 men) a fortnight previously. Fortunately, Reverend Ellis was one of the lucky ones, and by 29 September 1914 he was back in Wolverhampton and able to tell of his experiences. According to the newspaper, he was “looking wonderfully fit and well, but feeling somewhat stiff and a bit nervy, which is not surprising having regard to his exposure to the cold and the buffetting he received in the sea.” He had received a wonderful reception as he walked from his home in Newhampton Road to St Andrew’s New School in Gatis Street, with numerous parishioners stopping him to shake his hand. On the night of 22 September, he heard reports that the Aboukir was sinking, so he put on his pyjamas, trousers and coat and picked up his Prayer Book “which is perhaps the only book saved from the three cruisers”. Before they could take further action, the Hogue itself was hit by two torpedoes in quick succession, and Reverend Ellis estimated that “she sank in about five minutes”. He expressed amazement at the lack of panic, as the lifeboats were lowered and all the timber and furniture was thrown overboard. Men jumped overboard and made for the pieces of wood to keep afloat, but as Reverend Ellis could not swim very well he stayed on board “and went down with the ship”. By chance a spar hit him on the nose, and he caught hold of this and another one under each arm so he was able to float. He was in the water for about twenty minutes before he was rescued, along with twenty or thirty other men. At this point, the Cressy, which had been firing at the submarines, was also hit. The sinking of the final cruiser led to some men giving up hope, but Reverend Ellis was able to use his Prayer Book to keep up their spirits, singing hymns and songs like “Its a long, long way to Tipperary”. After four hours they were picked up by a Dutch merchant ship and taken to Holland. As some of the men “hadn’t a stitch on”, Reverend Ellis had given away his coat and trousers, and was left in his pyjamas. We learn that a Bilston man named James Barratt (27), was a stoker on the ill-fated Cressy. His home was at 23, Hall Green Street, Bradley, where his parents are eagerly awaiting news as to his safety. As a naval reservist he went to Chatham in July for his last training, but war was declared whilst he was there, and his boat joined the North Sea squadron, where, according to letters received from him, they have since been patiently waiting for the Germans to show themselves. He was to have been married immediately upon his return, and his fiancee, whom our representative saw this (Wednesday) morning, is buoying herself up with the hope that he is among the 700 rescued. It was from her that the loan of a photograph was obtained. The young lady stated that she heard from her lover as recently as Sunday morning last. Singularly enough in this letter he refers to the Germans not daring to show themselves, little dreaming that within so short a space of time he would have so much cause to realise the nearness of their prescence and the dangerous work he was participating in. Whilst there are no James Barratts born in Wolverhampton at around the right date, there is one whose birth in 1888 is registered in Dudley, so presumably this is the right gentleman, as he was born in Daisy Bank. On the 1911 census he was incorrectly listed at his parents’ home address (his name was crossed out), as he was already a stoker in the Royal Navy. His parents, John and Annie Barratt, were living at 23 Hall Green Street with James’s siblings Louise, Lily, Violet and William. Without knowing the name of James’s fiancee, we are unable to confirm further details about her. The HMS Cressy was sunk by a German submarine on 22 September 1914, killing 560 of her crew. Three days after the above article, on 26 September 1914, the Express & Star noted that Barratt’s parents had received a telegram “stating that their son, who was a stoker on the Cressy, was among the rescued and is safe in Holland”. However, it appears that this report was incorrect, as the Commonwealth War Graves Commission site contains the record of Barratt’s death aboard the Cressy. He is commemorated on the Chatham Naval Memorial in Kent. It is noted in the Express & Star of 9 February 1917 that Lance-Corporal Joseph William Bolton from Blakenhall of the South Staffordshire Regiment (number 9509) had died of his wounds. Son of Mary A. Page (formerly Bolton), of 19, Cobden St., Blakerhall, Wolverhampton, and the late Joseph Bolton. He died on 11 January 1917, and is commemorated at Mailly Wood Cemetery in France. His rank on this site is listed as “Private”, but the attached Grave Registration Report confirms that he was a Lance-Corporal. If anyone can confirm further details about this man, we would be glad to hear it! Three brothers from the Landucci family served the colours during the First World War. They were the children of Alexander (a stone mason) and Annie Lavinia Landucci (nee Walker) who lived in Whitmore Reans. In the 1901 census the family are living at 158 Coleman Street, and the household consists of the parents, four sons (George, Francis, Ernest and Edgar) and three daughters (Annie, Lilian and May). Alexander Landucci died in 1907, so by the 1911 census Annie Landucci was a widow. The family were living at the same address. The daughter, Annie, was no longer living with the family, and they had an additional brother, Harry. Two of the serving brothers, George and Ernest, are featured in the Newhampton Road Wesleyan Church Roll of Honour, which is where the photographs have come from. The oldest brother, born in 1888 in Burnley, was George Louis Landucci. In the 1911 census he was listed as a plumber. He enlisted in October 1914 in the 6th Battalion of the South Staffordshire Regiment (no 3598). He was transferred to the 5th Battalion of the Lincolnshire Regiment (no 266226). Unfortunately he was gassed at Ypres and died at Bapaume from wounds received in action on 21 March 1918. He is commemorated at the Grevillers British Cemetery in France. Francis Charles Landucci was born in 1893 in Wolverhampton, and was listed as a lockmaker on the 1911 census. He enlisted with the Royal Engineers (no 471624). He survived the war, and died in Shrewsbury in 1946. He does not appear to have married. Ernest Landucci was born in 1899 in Wolverhampton. He enlisted in the 52nd Durham Light Infantry (no 90914) in April 1917 and attained the rank of Lance Corporal. He served in France and was gassed in Lens in May 1918. However, he survived, and was demobilised in February 1919. He married Eileen D. Haigh in 1940, and they went on to have two children – Patrick and Mary – in 1941 and 1947. Ernest died in Islington, Greater London, in 1967.